Getting a digital copy of an old vintage pattern is a very nice thing. Its usually a thing that you have to pay for. Most collectors of old pamphlets and magazines with vintage patterns are selling (digital) copies of those patterns. But not all of them. Some give them away. I have a few scans of vintage patterns to share here at Roving Crafters. I love vintage. I love the unique look of those older designs, but I also love all the quirky details of the patterns themselves. Most of all, I love the idea a keeping an old pattern alive and in circulation. Crochet and knitting and spinning have always made me feel connected to the past. Vintage patterns just feeds that passion. So for today I have the Summer Frost Doily. As you can see on the right side, crafters were instructed to “cut out and save this page”. And they did. Consequently I have no idea where it came from. I went looking on the internet for more information and found… that another blogger had also shared, for free, a scan of this pattern. 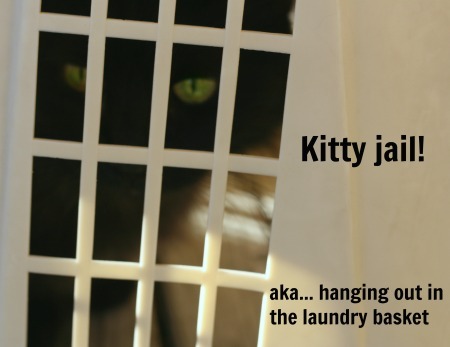 KittyandMeDesigns posted this pattern. According to her, its from The Farm Journal and she estimates it was published in the 1940’s. 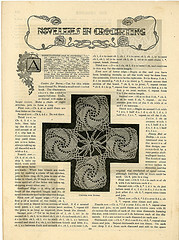 More importantly, she has a other scans of vintage patterns that she has published. Ah ha! Making scans of vintage patterns available for free is a thing (is what I thought when I saw her collection). So I went looking and found a few other collections from various bloggers and put together this round up. It was a bit tricky (for me) to track them down since they are hidden in a sea of for-sale offers on etsy and ebay. But the vintage freebies are out there in all their black and white faded yellow glory. I applaud these fellow bloggers for their work and their generosity even if they did steal my idea before I had it. 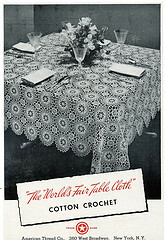 World’s Fair Table Cloth Pattern originally published by The American Thread Company. She might have more. That lady has been blogging steady for 8 years has mountains of posts. 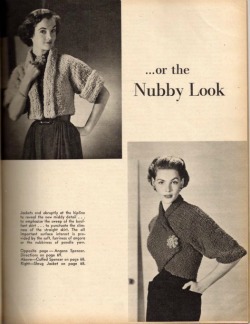 A Crochet Shrug and a Knit Spenser from 1952. No source given. 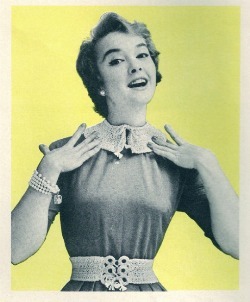 A Crochet Collar and Belt pattern from the 1950’s. No source given. This is the mother lode for scans of vintage patterns. While Vintage Crafts and More is a site dedicated mostly to selling scans of vintage patterns, they publish a freebie every Friday. 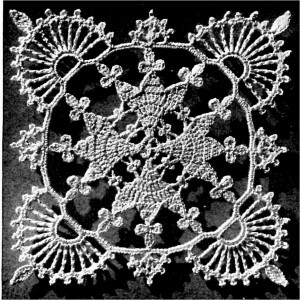 Lace Valentine – a bedspread motif published in Lily Crochet Cotton circa 1940. Isn’t that just outstanding? In the blog post at the link you’ll find some stitch instructions and a pdf download for the one page pattern for that motif. So have fun wasting many hours hunting and pecking and downloading more scans of vintage patterns than you can every reasonably need. I did! 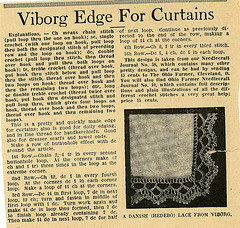 10 Comments on "Scans of Vintage Patterns"
I was skeptical about that pattern stating “complete directions on this page”. I’m going through my ‘vintage’ stuff now. So many older patterns are so confusing! Like that Viborg Edging – “make a row of buttonhole effect”… What?! It’s like putting together a puzzle or solving a mystery. It can be tedious, but I love it. Thanks for reviving your vintage patterns and sharing more! Yeah that “button hole effect” is a new one to me too. I know how to make a button hole in crochet of course… maybe its like that… maybe. You are right vintage is like a brain teaser. Each of those old patterns has its own code. Why do we even bother???? I love the vintage patterns…. over the years I have been able to collect some vintage pattern books and also have some that were my grandmothers!! Thank you for sharing these!!!!! You are very welcome. maybe someday I can figure out how to start a repository of vintage pattern scans that anyone could contribute to. Its something that I will do just as soon as I’m smart enough to figure out how t do it. 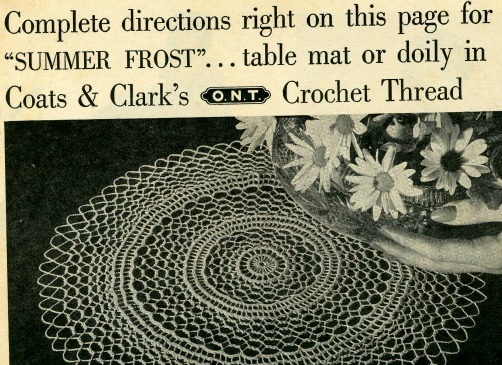 Those vintage crocheters were better crafters than I am and they must have had better glasses. No other explanation fits. They did do everything in tiny thread didn’t they? Big thanks to whomever it was that changed the landscape of crafting and made working with thick yarn fashionable. I love these patterns, they are fantastic! I love the idea of keeping vintage patterns alive! Me too. Those old patterns always give me ideas. its a great place to go for inspiration. Its also a peek into the idealized view of women’s lives from that time. Thank you fot sharing these and breathing new life into them. 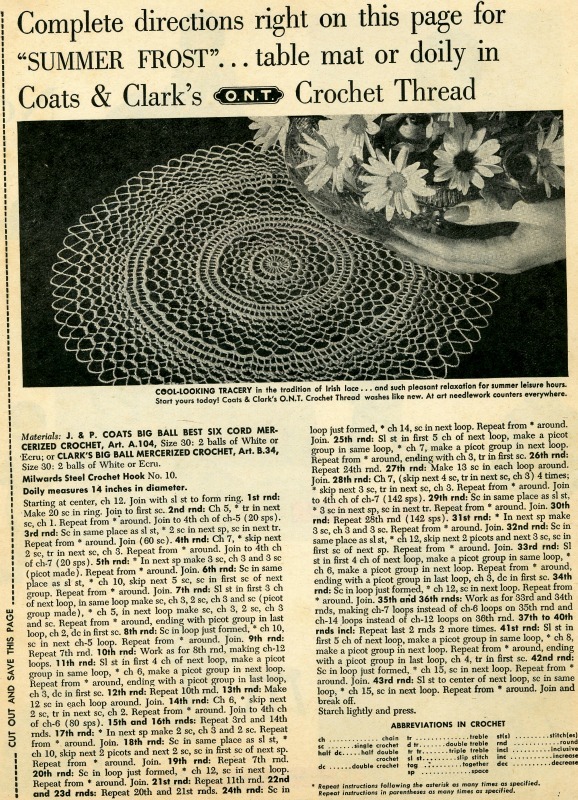 I love vintage crochet but those patterns are such buggers. My grandmother was an obsessive crocheter and tatter using feed sack string and I don’t remember seeing her with a pattern. Maybe I just didn’t know then what I was looking at. 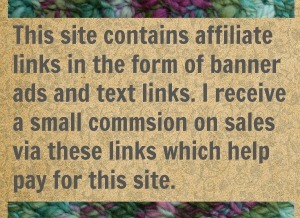 Maybe by the time you were around your Grandma had worked enough patterns that she could crochet without them. Even so many of those vintage patterns are quite ambitious compared to what is often published today.